Complete with the dead rabbit and chicken. On the hour (and half hour) a tiny wooden bird comes out through the door and emits a pleasant “cuckoo!” The counterweights are large metal pinecones. Yes, it is hideous, but it is somehow beautiful in its hideousness. It may even be worth some money. And now my mom wants to get rid of it. As I’ve stated, I love clocks. When the sad little clock downstairs fell off the wall and broke (an accident, I swear) we wanted to get a clock that Evie would enjoy. 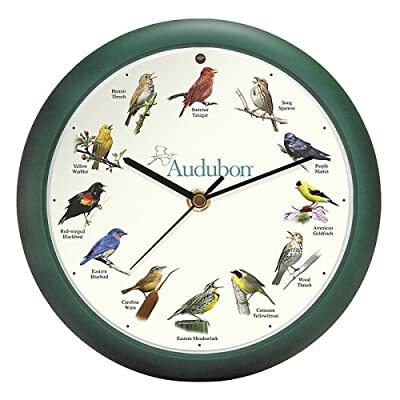 We toyed with the idea of getting a cuckoo clock, but we ended up getting a “birdie clock” similar to the one my grandmother has with different bird calls on the hour. Now I admit that the grotesque hunting clock doesn’t exactly fit with our decor. There is no “hunting lodge” room in our house. That being said, there has to be a place for it somewhere in our house. I’d hate to lose such a old, well constructed clock*. So please leave some comments and help me convince Sara this clock is worth saving! *Note that I have no reason to believe it is old or well constructed and is probably a knock off to begin with.